Yet Google+ has not been launched publicly to every one but its usage stats are going quite high, and even its applications are not left behind with which we can use Google plus with more ease. Like today I’ll share some applications i-e clients for different platforms like mobile phones as well as a normal computer. Download the GClient from here. And then install it. It needs Net Framework version 4 and if its not already installed in your computer OS then during the installation it will prompt you to install it. Hit Yes and let the things go. It’s a kind of browser specially designed for the usage of G+ and it can’t be such an awesome and permanent solution but its time saving. After downloading you will be asked for your name and email address. Don’t worry they will send you free license code at your email address in order to activate this GClient. After that all things are noob friendly, You can setup every thing at your own. From the right bottom of you task bar near the clock run the g+ client and then login. After that start using it. Visit the Mobile Project of the Google Plus to get the latest application in order to use them in your smart phones. Likely in case of Nokia no application has been developed yet for s40 (Java Enable Mobile Handsets) phones instead for s60(Symbian Handsets) phones the application is available. In case of android and iPhone the application is available at official market and store of android and iPhone, Respectively! You can choose that what you are going to share is for which circle. Like just for friends, teachers or for a boss. Get stream by Friends and all circles at instant. Before, there was no share post option in the android application. But just now the share feature has been given in the android application too. Just grab your copy from android market and use it. Since, Social Sites are the second name of sharing content and making this world global village. In order to share, press menu and then share it with the circles whom you want. As soon as reshare has been hit, It will instantly appear in your feed. It’s a simple Google plus application to keep track of all our notification using mac. 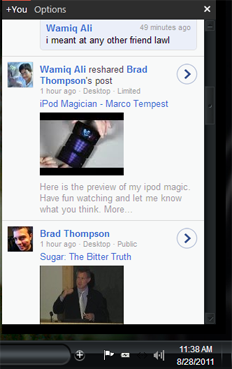 Its similar application as if you are using Google plus under mac browser. But its good for those who want to keep Google plus separate of all the things. And don’t want to login again and again in browser. The developer of this application is working hard to give out more better and advance response. This application has been hosted on CloudApp here. It’s a quick download, and installation simply involves unzipping and copying the Google+ application to your Applications folder. Its not an official release by Google Plus so use at your own. Disclaimer: This is not a native app, just a ported browser. We haven’t heard any thing scam related to it. So, assuming it to be safe we have published it.